Inspired by Chris Hahn’s account of his trip to Little Wars (see his earlier post) and Mike Crane’s mention of his plans to attend Bayou Wars next month, I had a thought. 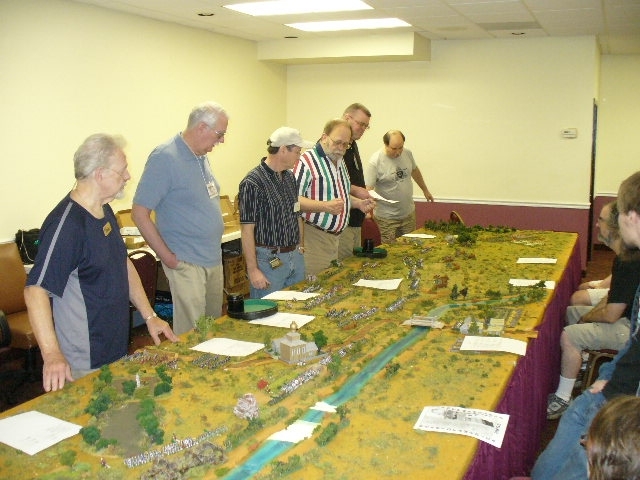 Border Wars, put on by the Heart of America HMGS, was within driving distance and came on an otherwise quiet weekend for me. Why not drive to Kansas City, Kansas, and see what they had to offer? Added incentives were two of the special guests. The legendary Duke Seifried was planning to stage a massive version of Borodino. Frank Chadwick, author of the Volley and Bayonet rules, would also be attending. I could even take my copies of the original V&B and its current version, Volley and Bayonet: Road to Glory, and get Frank to autograph them. It sounded like a plan. I hadn’t been to Border Wars before. In fact, it’s been quite a few years since I attended any gaming con. The HoA guys put up a thorough list of convention events at their website, so I looked forward to an interesting weekend. Border Wars is a small-ish convention. 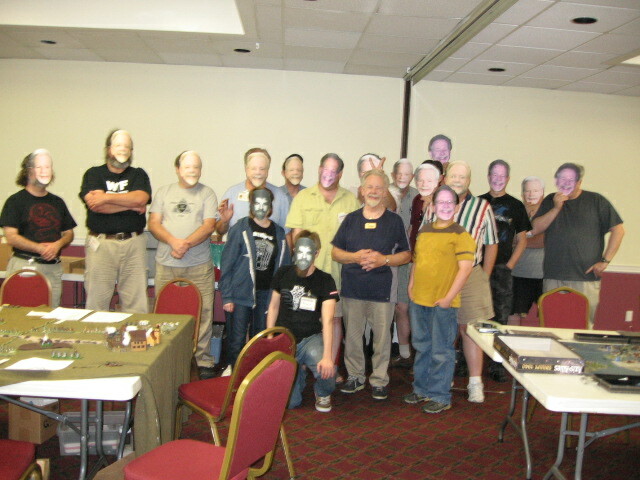 Toward the end, Brian Beal, one of the organizers, estimated that about 50 gamers altogether had attended. I don’t think I saw more than two dozen of them at any one time while I was there on Saturday, but they were an enthusiastic, and involved, group. As I walked around snapping photos (see below), the intensity I had observed at other cons was there a-plenty. Same spirit, even if the venue wasn’t huge. 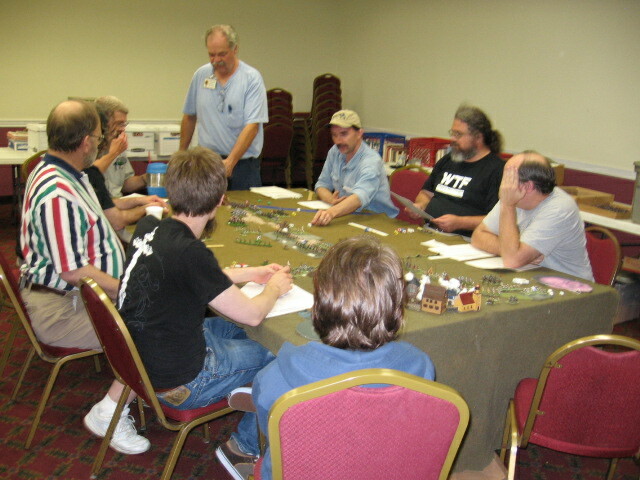 Since the con was rather small, there was only a limited number of games going on at any particular time. The Borodino game was certainly the big one and it ran about four to five hours, with a break for lunch. Other games that were scheduled included a couple of World War II Eastern Front games with N-scale armor, a Leyte Gulf naval game, a Warlord of Mars game played with “Gaslight 1889” rules, another Victorian-era fantasy game put on by Frank Chadwick called Mars Needs Steam!, a big Thirty Years War battle, a well-attended Axis and Allies game, and a combined naval-land game called the Battle of Zanzibar, based on an actual incident in 1896. As I’d hoped, I got a chance to talk with Duke Seifried and Frank Chadwick, although in the rush to get on my way to Kansas City, I neglected to bring my rules for Frank’s autograph. 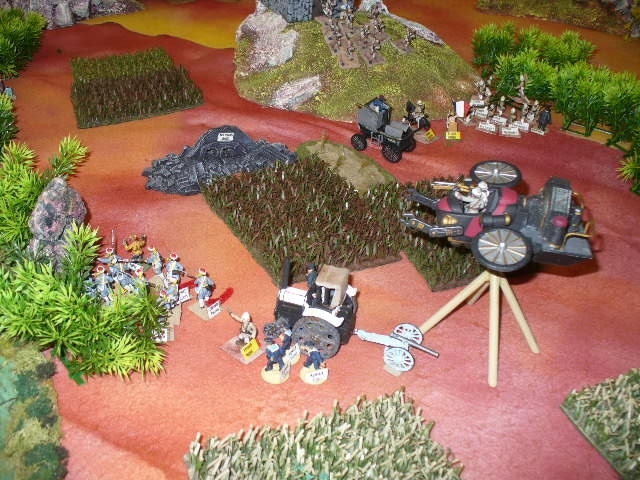 It turned out he had driven Duke to the convention and handled much of the Borodino game under Duke’s watchful eye. Duke has had health problem of late, although he said he’d been feeling much better lately. 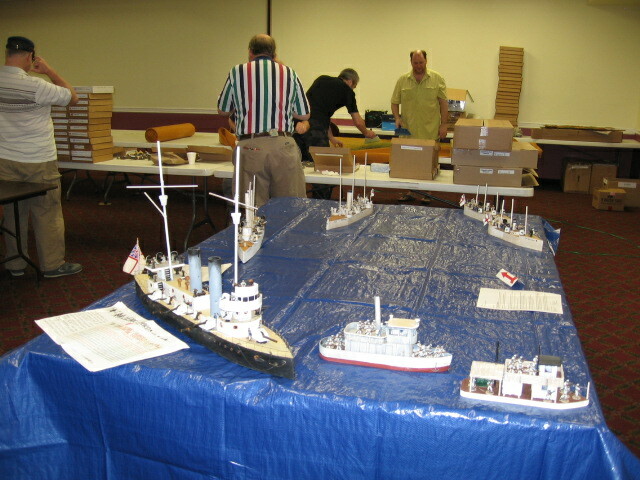 He’s also been selling off large chunks of his huge miniatures collections. 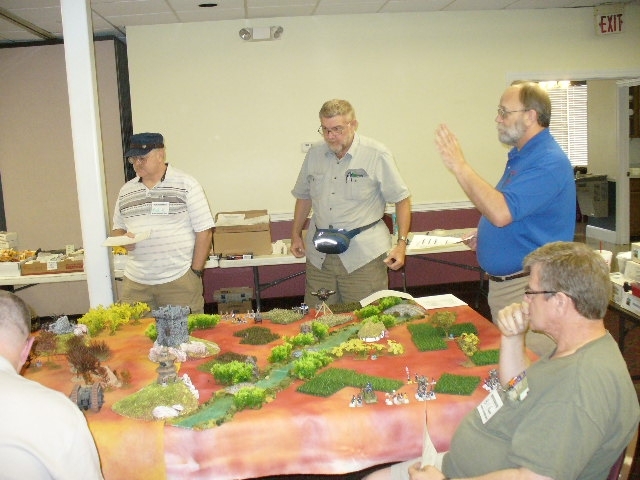 Frank Chadwick provided an after-action report on the Borodino battle. The Russians won this time, holding off the repeated French attacks. The French-allied Italians took an especially severe mauling, while Russian cossacks got into the French rear and contributed a lot to the eventual French defeat. 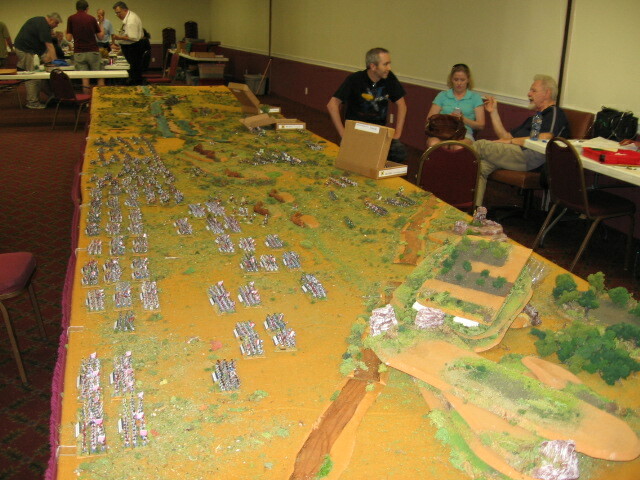 Frank estimated that there were more than 5,000 figures involved, spread out over a 24-foot table. It was a sight to behold. 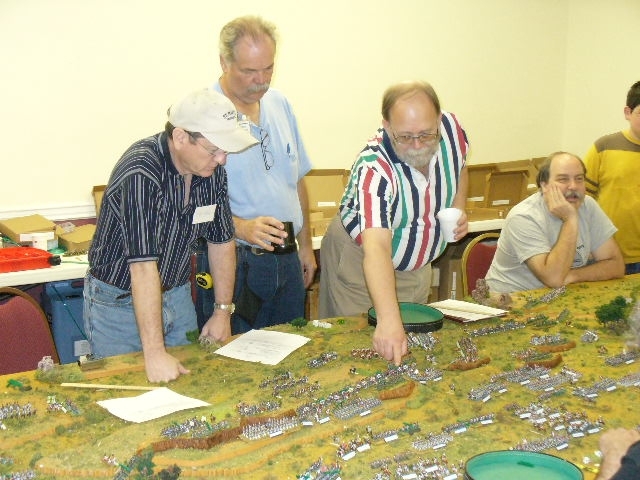 Duke Seifried, right, in the aftermath of the Borodino game. 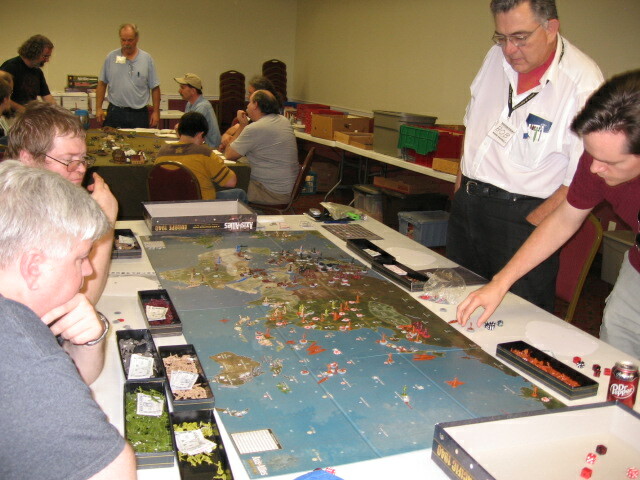 The big Axis and Allies game. All the other "Dukes" gather round the real one. The Thirty Years War game in progress. That's Frank Chadwick in the striped shirt on the left. One table (of two) ready for the start of the Zanzibar game. 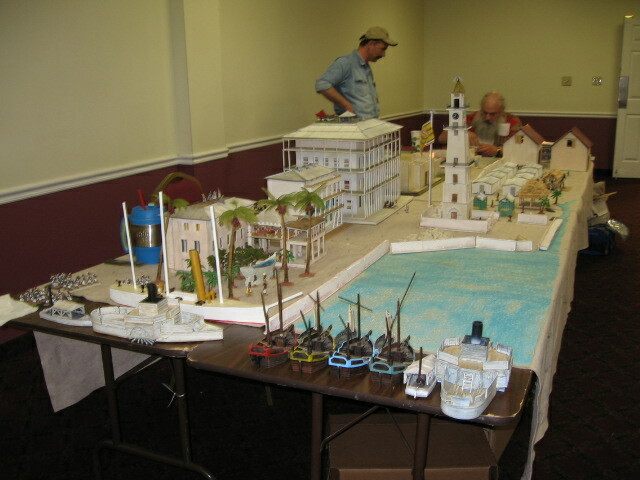 The second table being set up for the Zanzibar game. This entry was posted in Gaming conventions. Bookmark the permalink.